BlackBerry Essex on the way with WiFi | BlackBerry Blast! There's a new BlackBerry on the way called the Essex. The BlackBerry Essex is essentially the BlackBerry Tour, with WiFi. What is it with RIM and WiFi? Shouldn't their devices have included WiFi a long time ago? I have several Windows Mobile devices that have had WiFi for years. 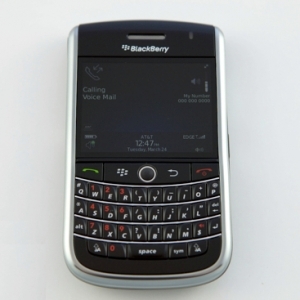 A users at the CrackBerry Forums spilled the news that the Essex is officially on the way. Engadget suggests that the reason for the added WiFi is Sprint has now mandated that all their devices include WiFi. The picture is of a BlackBerry Tour. You'll have to imagine the WiFi signals surrounding the device.